Suitable for: all kinds of party, costume party, show, fun activities, take MV, ted, slow rock, bars, dance halls, festival tricky, etc. Put on 2 AA battery, voice control, can flashing light and sounds. (For the sake of safety, Batteries are not included) Notice: Please switch ON the power on the battery box. Animated Hanging Grim Reaper features with loud creepy scream, light up LED red eyes. 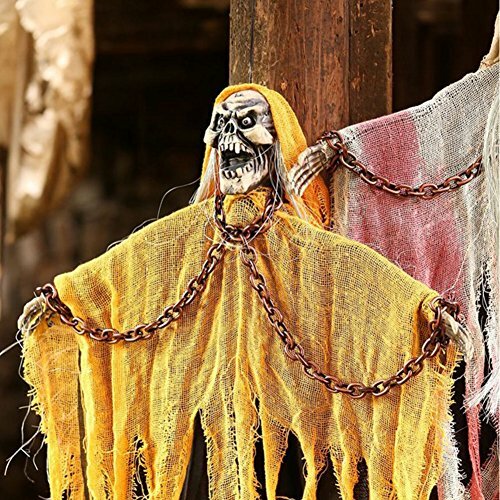 This hanging Halloween decorations gives off loudly haunted sound and flashing red lights in the eyes when activated by small touch or breeze. Perfect for hang from a tree, front door, on your porch, in the window, or in your living room, as the yard decoration on Halloween Great for greeting trick-or-treaters, or visitors to your haunted house.